Today, I have the pleasure of introducing a friend of a friend, Paul Smith! He's written an upper middle grade/lower young adult book called Jason and the Draconauts! Read on to find out more! The creature hiding in the barn can’t exist. Fifteen-year-old Jason Hewes knows it’s impossible. A live dinosaur would be more believable; at least dinosaurs once roamed the land which is now the Hewes Montana farm. But this beast from legend? Quite impossible—although it doesn’t seem to be going away just because it shouldn’t exist. Jason is about to reevaluate what is or isn’t possible. His discovery is very real, leathery wings and all. Nor is his new friend alone. Others of his kind are awakening from a centuries-long slumber. Realizing how traumatic contact between mythological beast and modern life could be, Jason and his impossible new ally devise a plan to integrate the newly awakened creatures into society through teenage interaction. What could possibly go wrong? As the sound of giant wings becomes a common occurrence on the Hewes family farmstead, a malignant force senses his old enemies are flying again. Determined to end an eons-long war forever, this being turns his attention to a small rural Montana town, a family farm, and Jason Hewes. Jason sprinted into the house and grabbed the largest kitchen knife he could find. Then he took a second in his other hand. Then he put a meat mallet in his back pocket. And then, for some reason, he grabbed a carrot peeler, just for good measure. He ran back to the front of the house and burst out of the screen door into the yard as he shone the flashlight ahead of him and mumbled, “Stupid, stupid, stupid” all the way to the barn. But in the short run to the old barn, the rain stopped. It was enough of a dramatic contrast that it made Jason pause in mid-run. He looked curiously into the sky and saw the clouds dissipating as stars became visible again. Had Jason been in any other state but sheer terror, he would have asked himself questions about the phenomenon, out loud, and probably made fun of weather forecasters again. But all he could do was keep going to the barn. Arriving at the barn’s large doors, Jason swallowed hard, insulted his own common sense one more time, and then slowly pulled them open. He saw nothing…mostly because it was night, and he hadn’t bothered flicking on the light switch yet. Jason always wondered why the previous owners had run power out to the red wooden structure. But he decided not to complain about it that night, and he groped along the wall until he found the switch and flicked the lights on. Judging by its size, he could tell this was what had impacted the earth and had caused the tremor that he’d felt back at the house. It was over thirty feet long and resembled—Jason couldn’t believe he was thinking this—a dinosaur. It had a long neck attached to a muscular body and narrowed to a very long tail. Its body was covered in scales that were colored shades of brown and gray. Spines ran along the length of its neck and the length of its tail as well, and each of its four legs ended in a three-toed foot, with each toe ending in a long, curved claw. Its head was oddly shaped; a large curved plate extended back from the creature’s eyes on either side, arcing upward into two points and vaguely resembling a plowshare. It had a short snout tapering off to a rounded tip, with two nostrils on the top just short of the tip. But what made Jason realize that this was no dinosaur were the massive wings sprouting from either side of the creature. The wings were batlike, and Jason estimated the wingspan was close to sixty feet. Wings like those were not vestigial, like those of an ostrich or emu; this creature was made for flight. He noticed the membrane of one wing seemed damaged, burned away to form a hole with seared edges. He followed the lines of the wings back to the body and could see the creature’s chest expanding and contracting slowly and rhythmically. It was breathing; it was alive. Unconscious but alive. Paul Smith lives in upstate New York with his wife and two sons, where he works with emotionally disturbed and mentally ill children. He earned a master’s degree in social sciences from Binghamton University in 1999. 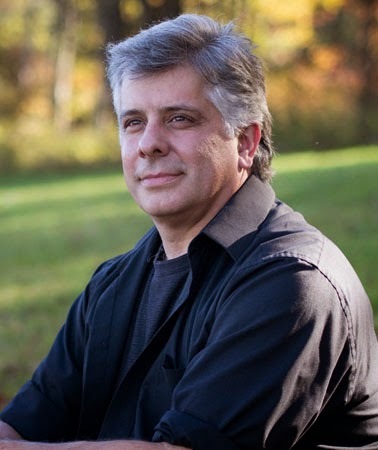 A lifelong love of science fiction, fantasy, and superhero stories influences Paul’s writing. His most recent work was a popular weekly online series that generated over 20,000 views. 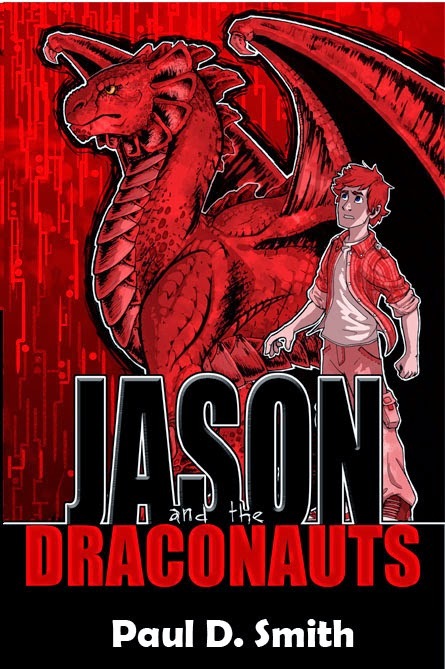 Jason and the Draconauts is his first novel. BUY Jason and the Draconauts!